Never released commercially as a MONO, only Stereo. This is housed in a Stereo cover with 2 promo stickers affixed to the front cover indicating promotional status and MONO sound. Incredibly scarce, to say the least! The title track is a re-working of the Ray Sharpe song, "Help Me", which King Curtis produced and recorded in New York City in 1966. 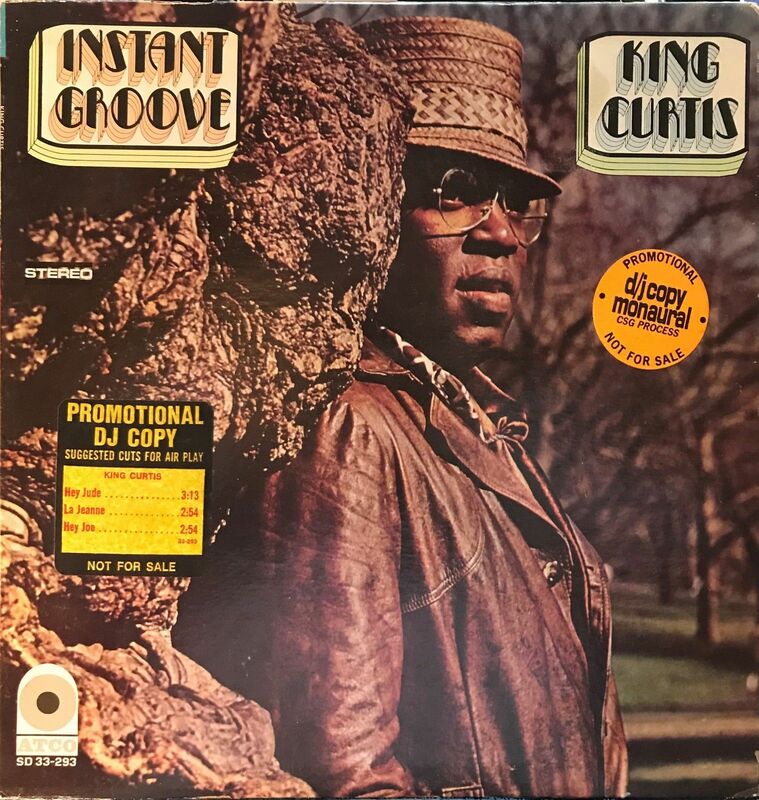 This cut - "Instant Groove" - has the exact same backing track which featured JIMI HENDRIX on guitar along with Cornell Dupree (guitar), Chuck Rainey (bass), Ray Lucas (drums), Willie Lucas (baritone sax) and, of course, King Curtis on tenor sax. This same track later became "Save Me" for Aretha Franklin, but with numerous overdubs and Hendrix's guitar parts removed from the mix. Killer funk and deep soul grooves in GLORIOUS MONO. When will you find another copy? Both the vinyl and cover are in solid, strong VG+ condition. Sounds great. Grab it while you can. Buyer pays shipping costs. Domestic shipments for 12" or 10" discs via media rate = $5.00 for up to 2 records / $6.50 for 3-5. Shipment to Europe & Asia is $24.00 for 1-2 records / Contact us for rates for 3 or more. Shipment to Canada and Mexico is $16.00 for 1-2 records / Contact us for rates for 3 or more. Rates for 7" discs = $3.50 for up to 3 records / $5.50 for 4-7. Shipments of 7" discs to Europe and Asia is $14.00 for 1-3 records/Contact us for rates for 4 or more. To Canada and Mexico, the rate is $10.00 for 1-3 records/Contact us for rates for 4 or more. We do NOT ship to the following locations: Africa, Cambodia, Vietnam, Venezuela, Iraq, Afghanistan, Azerbaijan Republic, China, Georgia, Kazakhstan, Kyrgyzstan, Mongolia, Pakistan, Russian Federation, Tajikistan, Turkmenistan, Uzbekistan, Albania, Belarus, Bosnia and Herzegovina, Cyprus, Italy, Moldova, Slovenia, Ukraine, South America. All of the 'STILL-SEALED' albums that we sell are GUARANTEED to be original FACTORY-SEALED records and, as such, are considered collectors' items. We cannot accept returns on STILL-SEALED albums if the shrink wrap has been torn, opened, punctured or damaged in any way. All purchases ship within one day of payment. Tracking information will be provided. Records are professionally packaged in industry-standard heavy cardboard record mailers and secured with cardboard fillers and/or bubble wrap. For albums, all non-factory-sealed records are removed from the cover and shipped in the same polyethylene sleeve so as to negate the possibility of seam splits during transport. For box sets, the records will be shipped INSIDE the boxes, as this is the safest way to make sure there is no collapse or damage to the box itself. And no matter what it may say elsewhere, we do NOT ship to Italy. Sorry. Nothing personal. It's just that your postal system has lost or damaged so many shipments over the years that there is no longer a sense of trust involved in shipping packages to Italy. All items are VISUALLY GRADED unless otherwise stated. We pride ourselves in ACCURATE and EXTREMELY CONSERVATIVE grading.